With more and more people paying attention to the skills gap, there has been, thankfully increased, support for vocational courses. One area of support has come from legislation which allows individuals from industry to streamline into teaching positions. Currently, in Michigan, an industry professional (4,000 hours of relevant work experience within a 6-year time frame) can walk into a teaching position, with no teaching credentials. They must show they are making progress towards a teaching certificate, but are given an overall lenient time frame to do so. The state will fund their program as it will be considered a CTE program (Career and Technical Education). Here's a hypothetical: Tim has worked in industry as a CAD professional. Tim got a 2 year degree in engineering and design. He worked for various companies doing various amounts of CAD work. He decides he wants to teach and applies at a local school to teach CAD. The school hires him with enthusiasm, especially knowing that he is going to bring money in from the state for the program. To get a TE certificate, one must graduate from an accredited university with a four-year degree and pass all state license tests for teaching. So, hypothetically: Matthew is TE certified, has taken courses in most of the above material and has been acknowledged by the state as able to teach all of the courses above; he can teach CAD, and more. Tim, with a CTE certification, is only able to teach CAD. Matthew receives no state funding for his program, while Tim does. Which candidate is more valuable? 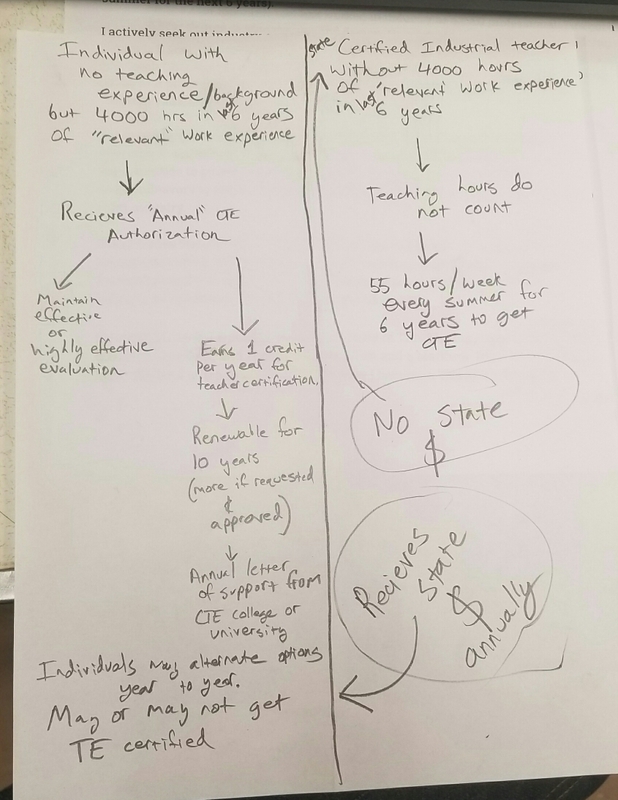 Someone authorized by the state to teach one skilled trades course who will receive state support, or someone who is authorized by the same state to teach a multitude of courses across the skilled trades but does not receive state support? The market is screaming CTE. Call it right, to favor people from industry and disfavor people with an education degree; call it wrong, but the market doesn't care. In the current market, put Matthew against Tim in a job interview for any grade 9-12 industrial course and Tim will win. I've watched it happen three times in three years within an extremely small data pool. Districts can not justify funding a TE program. With the state dumping increasingly more money in CTE programs, and most all educational funding receiving cuts, districts know they have a prayer going with CTE. People like Tim came from industry and became great teachers. Really great teachers. Some haven't. Just like some TE recipients have left college to become great teachers. Others haven't. I really have no beef against Tim. I like Tim. Tim is smarter than me. I wish I was as smart as Tim. (Every time I make a student loan payment or put in a donorschoose.org request). Actually, I'd like to be both Tim and Matthew. There are some advantages to not being CTE. From a job security standpoint, it's stupid for me to not have CTE. And here's where I have beef. It is fully realistic for Tim to get a CTE certificate and get his TE certificate. In fact, they set Tim up for success in doing so. However, the reality of going from a TE and earning a CTE...pretty much nil. (To gain 4,000 hours in 6 years, I'd have to work 55 hour weeks every week of every summer for the next 6 years). I actively seek out industry experience to improve my teaching craft, love teaching the trades, and I do a great job doing it. Why did the state say that both Tim and I can teach CAD, but I'm not worthy of financial support? Why allow me to teach CAD in the first place if my state approved qualifications are inadequate for state support? This is a very contradictory stance for Michigan to take. There is a larger shortage of CTE/TE teachers than ever. There is also a larger shortage of skilled labor than ever. The state would be wise in offering opportunities to current educators to gain industry experience and fund their endeavors to teach the trades while also supporting the few brave enough to make the jump from industry. Every trades teacher will acknowledge that you can be all content knowledge and no understanding of education or all understanding of education and no content knowledge and you won't succeed as a trades teacher. Many don't. It takes a balance, which many CTE and TE teachers have. If I could go back, I would have gone the route of Tim. The logic makes sense. More qualified, less debt, and I could become a Tim and a Matthew. Right now, unless I leave the field of teaching, I'm not sure how I become a Tim and a Matthew. A snapshot of Tim's path vs. Matthew's path with districts favoring Tim's path using the ACA document attatched above the photo prior to May 17, 2018. This document was updated May 17, 2018. Below is the document from before May 17, 2018 that I referenced for the below photo.